I am trying my best. 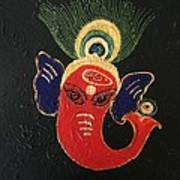 Goal is to create 108 Ganesha paintings. All one of a kind. Ganadhakshya , is Lord of All Ganas (Gods). The process: Deeply textured with peacock feather motifs. First, peacock feathers were painted on canvas with thick layers of artist grade inks and acrylics. 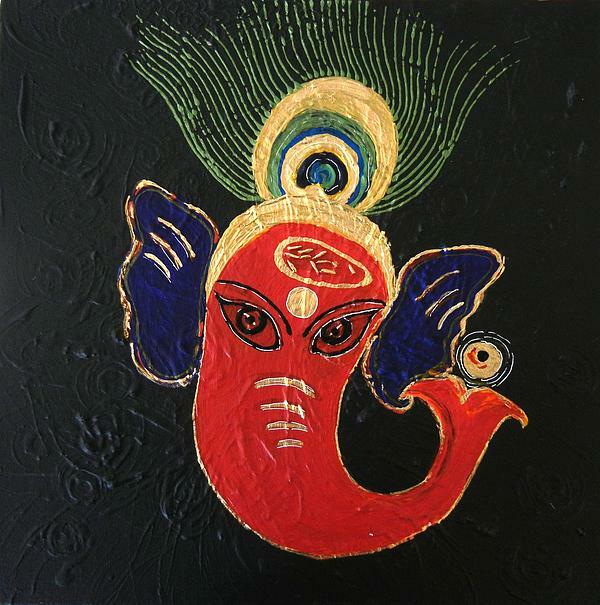 Second, the canvas was black washed with heavy duty acrylic paint which took quite a few days to dry. 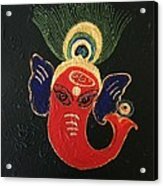 The final step was to paint Ganesha on this textured canvas. The forehead has real rice grains and the peacock feather texture is amazing to feel with bare hands. This painting is done on gallery wrapped canvas, wired in the back and ready to be hanged. Coral, purple, green and gold with hints of turquoise adorns this work or art making it one of a kind.